Here’s a before and after picture of a project we completed on Aetna Ave NE in Monticello MN. 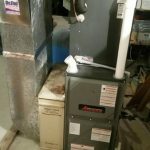 This was an upgrade to a 96% efficient furnace. This furnace will run more efficient and give our customer a savings on a monthly basis. Give us a call if you are looking to upgrade your furnace.